1. Goods found floating after a shipwreck. 2. People or things considered useless or unimportant. From Old French floter (to float). Ultimately from the Indo-European root pleu- (to flow), which is also the source of flow, float, flit, fly, flutter, pulmonary, pneumonia, pluvial, and fletcher. Earliest documented use: 1607. Cat Sebastian; The Lawrence Browne Affair; Avon; 2017. 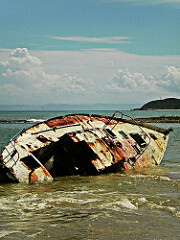 See more usage examples of flotsam in Vocabulary.com’s dictionary.